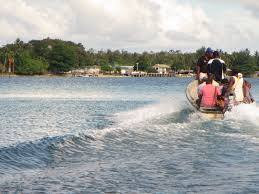 A boat carrying 12 passengers and travelling from Namatanai to Lihir on the weekend encountered engine failure is now missing. Disaster Coordinator Michael Lamusan said missing boats within these waters between Namatanai and Lihir are being reported too frequently and this is due to the negligence of boat owners who fail to make sure to check the weather and their boats for mechanical faults. New Ireland Province is currently experiencing light showers or drizzles throughout the last week after heavy downpours a couple of weeks ago and boat owners have been urged to be cautious while travelling as strong (South-East) winds are also continuing. Meanwhile a man from Ngabalus in Kavieng District is currently missing also after his family found out he never returned home from diving trip on Saturday. Furthermore the Provincial Disaster Coordinator raised concerns that the New Ireland Provincial Emergency Call Centre only covers the Namatanai District and is not very effective in giving information for response from the Provincial Disaster and Provincial Maritime Safety office. He said the Call Centre must also expand its coverage throughout the Province to assist all people and not only in Namatanai.